Warner Bros. Home Video is obviously looking to cash in on fans doing early Christmas shopping this November. 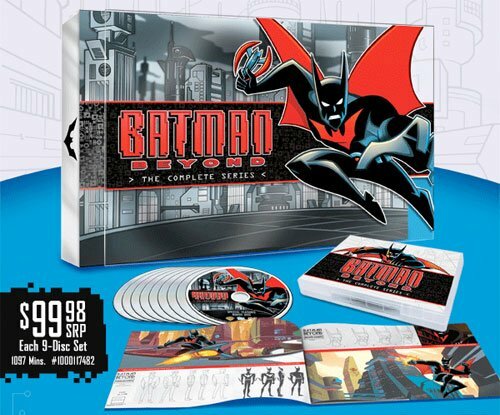 We reported earlier about their announcement of the complete Scooby Doo set, and now they've released word that a complete Batman Beyond set will be arriving later that same month. Mark your bat-calendars for November 23rd and start saving your bat-pennies, because this sucker is listing for $99.98. Batman Beyond has always been the red-headed stepchild of the animated DC universe, not getting nearly as much press as the admittedly awesome Batman, Superman, and Justice League animated series. That's a shame, though, because even though Batman doesn't seem like an ideal character to be given the futuristic sci-fi treatment, the story of Bruce Wayne's young successor, Terry McGinnis, is every bit as thrilling and clever as the rest of the Dini/Timm output. Hell, the brief opening segment where we see what lead to Batman's retirement is as compelling a moment as any other version of the character I've seen. From there, things pick up in 2039, where we learn how 16-year-old Terry learns Bruce's secret and is reluctantly taken under his wing as the new Batman and gifted with a high-tech version of the iconic suit.